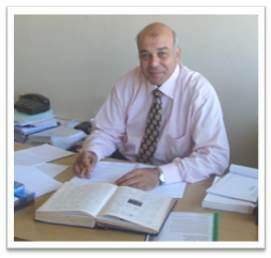 Elsayed S. Elsayed , Ph.D.
Elsayed S. Elsayed is currently a full professor and the head of Mechanical Engineering Department, College of Engineering and Technology, Arab Academy for Science, Technology and Maritime Transport (AASTMT). He received the B.Sc., M.Sc. and PhD degrees in Mechanical Engineering from Alexandria University, Egypt. •ME 526-Power Plant Measurement and Control. •ME 754-Simulation and Modelling of Mechanical Systems. •Theory of Lubrication and Sealing. •Dynamic Characteristics of Mechanical Systems. E. Saber and Khaled M. Abdou, "Advanced seal design for rotating machinery" , American Journal of scientific and industrial research, Vol. 2, No.1, pp 58-68. , 2011. Khaled M. Abdou, E.M. Attia, E. Saber and H.A. El-Gamal, "Flow Induced Vibrations in Journal Bearings for High Speed Rotating Machinery" , European Journal of Scientific Research, Vol.49, No.1, pp.73-86. , 2011. Khalead M Abdou, E.M. Attia and E. Saber, "Effect of Three-Dimensional Surface Irregularities on the Dynamic Stability of Finite Hydrodynamic Journal Bearings" , European Journal of Scientific Research, Vol.46, No.1, pp.036-047 , 2011. A. Sharara, A. Hassan and E. Saber, "Flow investigation for self-excited vibrations in a globe control valve" , AEJ Journal, Vol. 49, No.2, pp 101-114 , 2010. H.A. El-Gamal, E. Saber and A.A. Taha, "Modelling and simulation of a conventional hydraulic power steering system" , ICCTA Journal , 2010. E. Saber, M. Abdelgliel and M.Salama, "Kinematic modeling of omnidirectional mecanum wheeled mobile robot" , 20th International Conference of Computer theories and applications , 2010. E. Saber and H.A. El-Gamal, "Thermal effects in rotating labyrinth seals" , AEJ Journal, Vol. 47, No.1, pp 1-10 , 2008. H.A. Gomaa, E. Saber and H.A. El-Gamal, "A Mathematical Model For Magneto-Rheological Dampers Subjected To Sinusoidal Excitation" , Proceedings of ASME Eighth International Conference of Fluid Dynamics and Propulsion , 2006. E. Saber and H.A. El-Gamal, "Stability Analysis of Hydrodynamic Journal Bearings of Variable Axial Geometrical Configuration" , EGTRIB 7 The 7th International Conference of the Egyptian Society of Tribology, Fac. Eng., Cairo Univ., Egypt. , 2006. E. Saber, A.H. El-Beblawy and H.A. El-Gamal, "Exciting Forces Due To Pressure Oscillation In A Pipe With Sudden Contraction" , EGTRIB 7 The 7th International Conference of the Egyptian Society of Tribology, Fac. Eng., Cairo Univ., Egypt. , 2006. E. Saber, A. Hassan and E.M. Embabi, "A Study of The Performance of Stationary and Rotating Pocket Seals." , EGTRIB 7 The 7th International Conference of the Egyptian Society of Tribology, Fac. Eng., Cairo Univ., Egypt , 2006. E. Saber and E.M. Attia, "Oscillation-Induced Steady Streaming In Labyrinth Seals With Linear Motion" , Scientific Bulletin Faculty Engineering, Ain Shams University , 2005. E. Saber and N. El-Harazi, "Effect of three-dimensional surface irregularities on the steady state performance of finite hydrodynamic journal bearings" , PSERJ Journal,Vol. 8, No.1, pp 223-235 , 2004. O.Hamed and E. Saber, "Stability analysis of hydrodynamic journal bearings of finite length" , PSERJ Journal, Vol. 8, No.1, pp 236-251 , 2004. E. Saber and H.A. El-Gamal, "Effect of elastic deformation of bearing liner on its dynamic stability" , IUTAM, Cardiff Univ. U.K. , 2004. Theory of Lubrication and Sealing. Dynamic Characteristics of Mechanical Systems. Address : 16 Amen Khayrat Al Ghandor Street, Sidi Beshr, Alexandria, Egypt.